We recognized that our business decisions were getting bigger and more complex. Learning A-Z partnered with Hanover because research is the firm’s core competency. Given our size, limited bandwidth for additional projects, and concentration of industry experts over those with specific analytical skillsets, we will continue tapping into third party resources like Hanover to address our research needs. In partnership with Hanover’s research team, Learning A-Z gains research validation for a variety of strategic business objectives – therefore enabling senior executives to better leverage data when making critical product positioning decisions. We are always looking for more data, more inputs, and more insight to make good choices for the future of our business. 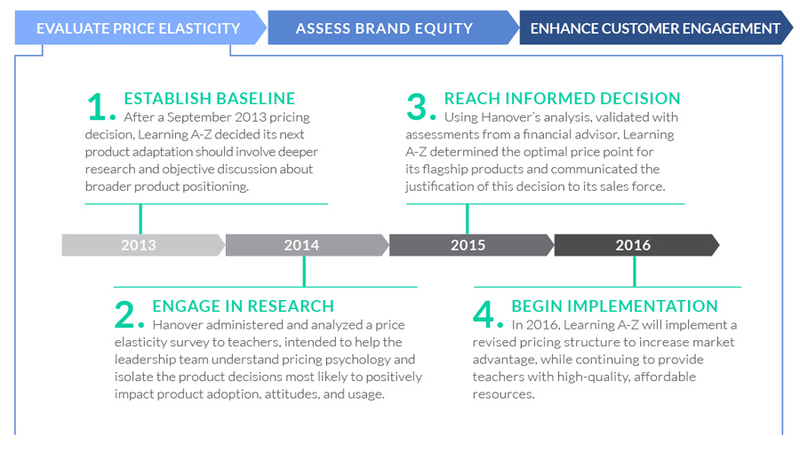 By leveraging Hanover’s price elasticity report, and corroborating these findings with our own research and assumptions, we were able to make a concrete business decision regarding our product positioning with confidence.